Stealth Weapon of the Confederate Navy. T oday we have many sophisticated weapons such as the world as never seen. We have stealth bombers and many of our navy ships contain some sort of stealth technology. So it might be amazing to some people that there was a stealth weapon used nearly 150 years ago in the American Civil War. Many historians agree that the Confederate navy was the first to use a submarine to sink an enemy ship. That�s exactly what happened on a cold February night in 1864 when a little vessel known as the H.L. Hunley submerged and attached a torpedo-like device to the U.S.S. Housatonic and blew it up. There�s little doubt that in those times a submarine would certainly have been considered a stealth weapon. The Union had a blockade in place around the port of Charleston, South Carolina, and it was from that harbor that the little Hunley departed in search of an enemy ship. With eight men aboard, the commander of the Confederate submarine, Lt. George Dixon, had orders to attack any Union vessel he might encounter. And although their mission had been accomplished, the men in the Hunley never returned to receive the gratitude and laurels that would have no doubt been heaped upon them for their heroic accomplishment. It is believed that the Hunley sank during its attack on the Housatonic or shortly thereafter. The men in the little submarine all died in the attack, but because of their previously unheard-of actions beneath the sea, they will forever be remembered for beginning a phase in naval warfare that continues to progress with new innovations and larger and more powerful submarines. There is no doubt that the Hunley was a deathtrap to operate. The men had to crawl through a 4-foot-tall passageway just to get to their places on a long, low bench. Each of them sat down at a hand crank attached to the Hunley�s propeller shaft. The ship was completely powered by the hands of the crew. The narrow top-secret submarine, built in Mobile, Alabama, by Horace Hunley from cast iron and wrought iron with a hand-cranked propeller, arrived in Charleston in 1863 while the city was under siege by Union troops and ships. The Hunley sank twice in sea-trial accidents, killing 13 crew members including its namesake, Horace Hunley. The Confederate navy hauled the sub up twice and recovered the bodies of the crew. But because of its innovative characteristics, the Confederates didn�t give up on the little vessel and stuck with their plan to use it to attack Union ships. 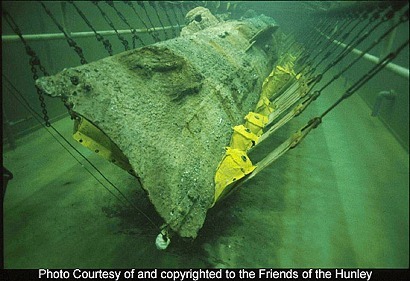 Thanks to the dedicated effort of many determined individuals, the Hunley was found in 1995 and raised in 2000. After it was recovered, a partnership was formed by those interested in restoring the Hunley. Aptly named �The Hunley Project,� the group had spent more than $22 million on the restoration through 2010. Drews said there had been previous submarines, but the Hunley was designed to sail in the open ocean and built for warfare � that was cutting-edge technology at the time. Recently, for the first time since it was recovered, people were treated to an unobstructed view of the 42-foot-long submarine after a massive steel truss that had been covering the top of the Hunley was removed capping 10 years of careful preservation. From the time it was brought to the surface over a decade ago, the submarine has been kept in a 90,000 gallon tank of fresh water to keep it from rusting. It�s interesting to note that most of the men aboard the Hunley weren�t even from the South. Forensic scientists believe four of the men were from northern Europe. One of the crew was from Maryland, a slaveholding state that didn�t secede from the United States when the Civil War erupted in 1861. Only two crewmen were from slaveholding states and George Dixon � who led the Hunley on its historic but doomed mission and became an immortal hero of the Confederacy � was from Ohio where slavery was illegal.